It was another great adventure with friends, and a tribute to those that selflessly give their time to support others. A group of us ran the San Diego Marathon on my 40th birthday, and now seven years later, we were back to celebrate Tami chasing 50. 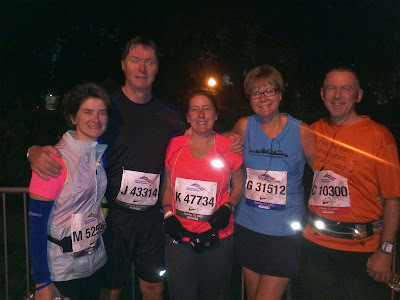 Five of us ran the Chicago Marathon - Tami and Cherie running their third marathon overall, and Brian and Debbie running their very first. Cherie promises that when she turns 50, the celebration will be more along the lines of drinks on beach of a tropical island. This would be my 15th marathon, but I was probably more nervous about how the day would go as anytime since my first. Work deadlines and twelve hour days at the office took their toll in the final month leading up to the marathon. I missed some weekday runs, and then my last long run was the worst run in several years. We ran in a deluge of rain and high winds, my IT bands knotted up, and knee pain forced me to walk the last three miles home. The pain did not go away after I stopped running, and I was hobbling around for several days, every muscle in my legs tight and sore. A few weeks earlier I thought I might set a new personal best, but now walking much of the marathon was a distinct possibility. We arrived at the starting area at around 5:45am, nice and early in anticipation of the crowds. Security was heightened after the Boston bombings, so I was nervous about the lines to get in. We breezed through, either a testament to their organization, or payoff for getting out of bed so early. Pictures, excited chatter, quick trips to the porta-johns, hugs and encouragement, last bits of advice and prayer, and it was off to our respective starting areas to await the starting gun. Boston was on our minds, and many of us wore blue bracelets and shoe laces as a symbol of solidarity, and I had printed up a special race shirt for the marathon as well. I wanted to focus on the positive community of marathons, and how these events bring so many people together to triumph over adversity. I wanted to focus on what is right with the world, rather than what is wrong, but I wanted to honor the victims as well. 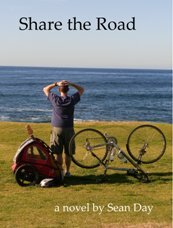 It is such a strange experience for most of us to be cheered along on our journey, and it is amazing how powerful this support is when you are feeling like you can't go on. I am ever thankful for those that come out in the wee hours only to support their fellow man, and none more so the three that senselessly lost their lives while doing this positive thing for complete strangers. There was thirty seconds of silence for the Boston victims a few minutes before the start. I have experienced moments of silence at events before, but there always seems to be a few people who keep talking or banging around. Marathon morning, the excited chatter stopped immediately, and the silence was absolute. Just after this, the National Anthem began. When PA cut out a couple words in, our corral spontaneously started singing. The professional continued, but so did we. When the PA cut out every five words, it was smoothly filled in by the amateurs. These two moments back to back were an extra moving start to an outstanding day, and just seemed to bond us together that much more. The Chicago crowds were amazing. I have never experienced such a large, enthusiastic string of supporters. It was estimated that there were 2 million people lining the streets, and nearly every step of the way there was someone on the sidelines cheering us on, sometimes three rows deep. It was unbelievable. I was choked up in the first few miles from the power of it. The energy carried me along to a fast start, probably too fast in the end. I covered the first 13.1 miles in just over an hour and fifty minutes. My hope weeks earlier was that I could sneak in under my previous best of 3:45 and for the first half I was at a 3:40 pace. My expectation, however, was that the knee pain would rear its ugly head, and that I would need to walk the last several miles. Halfway through my knees were fine, but my hamstrings and calves were feeling tight. My mind bounced back between realistic expectation, and dreams of a new personal best. Each turn brought us to a new neighborhood (twenty-nine in all), and a new set of cheering supporters. It was deafening at times, and it felt like we could be carried along on the blasting sound wave. Everything about this marathon seemed to be on a grander scale - the 40,000 runners, two-block-long water stations, twenty thousand volunteers, and of course the millions of spectators. I found myself running with an endless smile, shaking my head at the spectacle, and even mouthing "I love you all" to a particularly enthusiastic choir of voices. Though all of us shared the same road, each runner ran their own journey. No matter how difficult the marathon seems at times, all you need to do is look to your left or right to find someone running a more difficult road than you. It is not unusual at a marathon these days to see runners missing their lower leg, titanium and carbon fiber replacing what was once flesh. On this day of course, it reminded us of those that lost their limbs in Boston, but were determined to take to the roads once again. I passed by a woman who had lost her left leg to the hip, and was making her way to the finish line with a rhythmic swing. She was accompanied by a volunteer, as were several blind runners I ran beside. One runner had three volunteers, one behind and two flanking her, to guide her to the finish. I was again reminded of the determination of runners, and the loving support of volunteers, and I placed my hand on the nearest shoulder and simply said, "You're awesome". Though my heart was carried along on a wave of emotion, reality began to set into my legs. My hamstrings and calves grew tighter with each step, and my pace slowed with the inability to push off. I still had some time in the bank, but doubt, once a quiet voice, began to shout. I longed for the next water stop for the chance to replenish and an excuse to walk for a bit. Soon, I couldn't wait for the next stop, and pulled to the side of the road to walk and to try to let my legs unwind. I tried to keep the breaks short, but the pain grew stronger than the brain. I took in more fuel and just kept moving forward. Dreams of 3:45 were gone, but 3:50 was still in sight if I could just hang on. I shuffled through another wave of screaming supporters as I reached the 25.2 mile mark. Only one mile to go. Buoyed by the screaming voices of random strangers, I told myself I would not walk another step in the final mile. I cranked up the volume on the music that largely went unheard all day over the crowd, and I pressed on the best I could, trying to push my legs to the limit without allowing them to snap. There were two final turns to the finish I could picture in my head from The Spirit of the Marathon movie, the right turn leading us up a small hill before making the left toward home. Waves of cheers did their best to drown out "My Thanksgiving" playing over the headphones as I set my sights on the clock over the finish line. I crossed in 3:48:50 physically fragile and emotionally overwhelmed. A truly amazing day. I met Scott in the finish area and enjoyed a complimentary beer and the energy of the finishers as we waited for our friends to arrive. Tami crossed first, and then Cherie with a new personal best. Debbie, then Brian crossed next having thoroughly enjoyed the experience of their first marathon (other than Brian's two stops to get his knee taped). After making our way back to the hotel and getting cleaned up, we shared our common but unique stories over some Chicago deep dish pizza and cold beer. I had heard stories about how incredible the support was in Chicago, but it is something else to experience first hand. To have such a concrete example of the power of community with Boston heavy on our minds was amazing. To share this wonder with friends and strangers alike, and to see two more people experience the power of a finish line was fantastic. It never gets old, and it only seems to get better. And then there was this story that we didn't hear about until days later. With an entourage of support, a man with muscular dystrophy crossed the finish line of the Bank of America Chicago Marathon early Monday morning -- nearly 17 hours after he started. The 38-year-old passed the 26.2 milestone at around 1:30 a.m., surrounded by about 100 people. "My message is: If you dream it, make it happen. Your life is the most beautiful thing that could happen to you. Make the best with that, and share the best of that," he said shortly after finishing the race. Another in thousands of stories about human determination, and the support we can find in our fellow man. Though Boston reminded us how dangerous and fragile life can be, the marathon has reaffirmed that most people continue to strive to make this world a better place. Another amazing day. and for everything that broke my heart. Well written, my friend, and well experienced.